IT WAS A NOTIFICATION I’d been expecting, although I thought it would come by mail. Instead — perhaps because I’ve been a Red Sox season ticket holder since the days when Wade Boggs was playing third base — I got a personal call from a Sox executive named Sean Walsh. 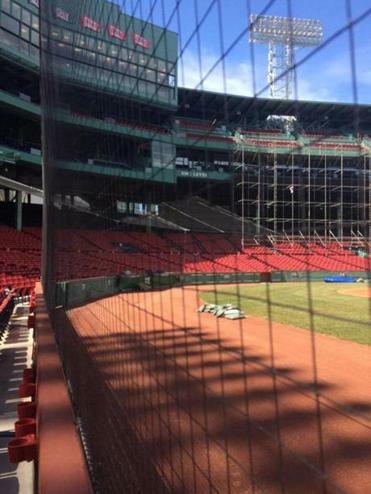 He wanted me to know that, because of several unfortunate accidents during the 2015 season, certain areas of Fenway previously open to the field were going to be covered by netting. One of those areas was where my two dugout seats are located. If I wasn’t OK with that, he said, the Red Sox would see what they could do about relocating those seats a little further down the first base line, near what the longtime Fenway Faithful call Canvas Alley. I wasn’t exactly crazy about that idea, partly because my current dugout seats are a lot closer to home plate, where you can actually talk to Sox batters in the on-deck circle (although few rarely respond, in their Olympian disregard of we lowly fans and their deep concentration on the game), but also because, as the years pass, your seats become a little neighborhood, and I like my neighbors. We’ve shared the wins and the losses. We were together when Dave Roberts stole second against the Yankees in 2004. We gave each other high fives when Papi grand-slammed in Game 2 of the 2013 ALCS against Joaquín Benoit, on the way to an improbable 6-5 victory over the Tigers. We were there in 2014, watching glumly as the Sox finished 25 games out of first, and in 2015, when they limped into the postseason 15 back. Big Papi hit his historic 500th on the road, but my little neighborhood convened to watch the celebration at Friendly Fenway on September 21, 2015, which just happened to be my 68th birthday. Was it a happy one? Do I have to tell you? So no, I didn’t want to move. Lots of memories in those seats. When even the guy selling the popcorn gives you a fist-bump and a “Hey, Steve, where ya been?” as he goes by, who would? Now I have to look through a net. For my own protection, I’m told. Sean Walsh — a company man for sure, but a really nice guy — sympathized with my reluctance, and emphasized that it wasn’t a Red Sox decision but one handed down by the MLB brass from on high. People had been hurt, Walsh said, and preventive measures had to be taken. I could have pointed out that fans have been getting hurt at ballparks since the first guy got the idea of charging admission at a sandlot game. In 1970, a fan was actually killed after being struck by a Manny Mota line drive at a Dodgers-Giants game. The fan, Alan Fish, was just 14 years old. In 2014, a Fenway fan was seriously injured by a foul ball that struck her while she was sitting in the luxy EMC Club (she sued). In June of 2015, a Fenway attendee suffered life-threatening injuries after being struck by a chunk of Brett Lawrie’s broken bat. In August, a Cubs fan was taken from Wrigley Field on a stretcher, after being nailed by a foul line drive off the bat of Kyle Schwarber. The newest feature at the nation’s oldest ballpark is a long curtain of black mesh to protect fans from flying objects. These are just a few of the more serious injuries, those that have been reported in the press. There are plenty more. According to a Bloomberg News report, 1,750 fans are injured in game-related incidents every year. That’s more than the number of batters hit by pitches (about 1,500, according to the Elias Sports Bureau). But almost 74 million fans attended MLB games in 2015, so the chances of being struck by a piece of bat or a foul line drive are pretty slim. Right up there with getting struck by lightning, I’d say. Maybe even less, if the fan is paying attention. Close to the field at Fenway, fans are specifically instructed to do just that by signs reading BATS AND FOUL BALLS HURT! PAY ATTENTION! 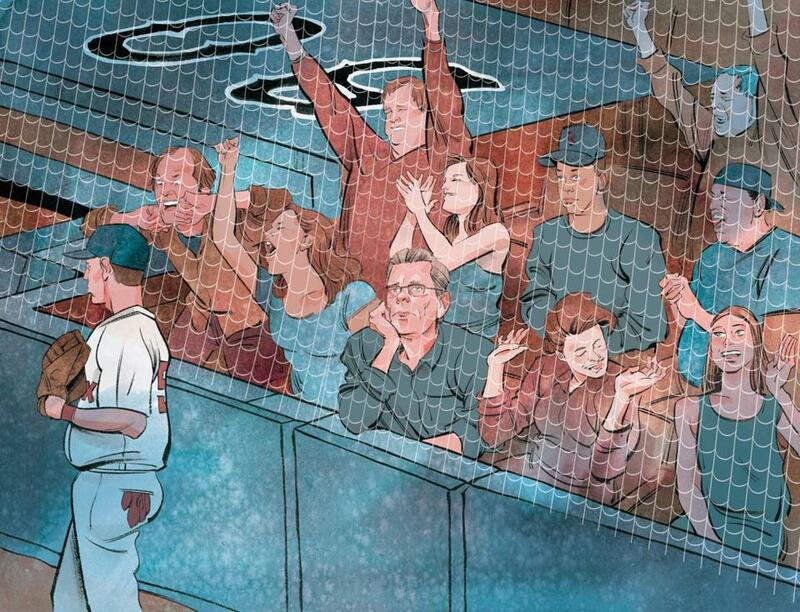 There are questions inherent in the decision to net, and I think they’re bigger than baseball. Like when does protection become overprotection? Is the safety of a fan at a public event like a baseball game the responsibility of the organization putting on that event? (According to the back of every MLB ticket sold, the fan is responsible.) When do safety precautions begin to steal away the pure joy of being there? I understand the Red Sox bear some responsibility, but I also accept my responsibility to take care of myself — to the best of my ability — when I’m at the ballpark. Is there a certain element of risk? Yes. Is the risk perhaps increased by being only two rows from the playing field? Yes again. But you can see everything from that vantage, not just the players but the breathtaking green of the grass, the bright white of the uniforms, the sky as it goes from blue in the top of the first to black by the bottom of the sixth. And hey, there’s always the chance that you can catch a foul ball instead of being hit by one. That chance goes away once the net is in place. In fact, a lot goes away. That netting may be a fine mesh, but you’re still looking through a barrier instead of right at the thing you came to see. Which means you’d do almost as well to sit home watching the game on TV. We live in an increasingly cosseted society, where forces larger than ourselves have taken charge of our safety. I have absolutely no problem with most of those safety measures. Childproof caps on medicines are terrific. So are seat belts, bike helmets, and mouth guards for kids playing contact sports. I think the decision to ban home plate collisions was the right thing to do, although such violent meetings were part of baseball as I knew it for most of my life. But if we are not to be a nation of overgrown children being cared for by various forms of the MLB brass (“for our own good,” of course), we have to take at least some responsibility when we attend a public event. Also, there’s something almost ludicrous about wrapping America’s baseball stadiums in protective gauze when any idiot with a grudge can buy a gun and shoot a bunch of people. I’d much rather see some action taken on that little problem. I’ll still be at Fenway Park every chance I get, and I guess I’ll keep my dugout seats — which are remarkably expensive real estate, given how poorly the Sox have played the last couple of years — but I feel terrible about the netting. It’s one more step toward taking the taste and texture out of the game I care for above all others. The bottom line? That net feels like paying good money to sit in a cage. Stephen King is a novelist, short story writer, and lifetime New Englander. His new novel, “End of Watch,’’ will be published in June.